That's the picture many people have when they think of blacksmiths. However, the practice of blacksmithing has changed a great deal since Longfellow wrote that poem. This is a craft with a long past, sure, but also one with a bright future. Blacksmithing – the name conjures up thoughts of pioneer times, of rugged old men pounding iron in a candle-lit stone room. For most, the blacksmith exists only in the past: a relic, replaced by modern machines and industrial factories. But as many interested tradespersons have discovered, blacksmithing is experiencing a Renaissance in North America. Skilled metalworkers everywhere are finding their unique and artistic abilities put to consistent, and often profitable, use. The Artist-Blacksmiths’ Association of North America (ABANA) now claims nearly 5,000 members, double the number it had 10 years ago. Blacksmithing is an old craft. During the mid-to-late 1800s, one could find a blacksmith in cities and towns all across Canada. However, with the Great Depression and World War II, the trade was all but wiped out, leaving only Farriers – a specialized subsection of blacksmithing focusing on horseshoes. The rest of the labour formerly done by blacksmiths was swallowed up by factories, leaving little room for the blacksmith of old. The ‘Renaissance’ began as little more than hobbyists creating metalwork art. Since then, the demand for such unique handcrafted work has grown substantially. While the majority of ABANA’s membership is still made up of hobbyists, the number of people taking up blacksmithing as a full-time or part-time trade is substantial. With blacksmithing once again emerging as a viable career path, now is the perfect time for those with an interest to take up an apprenticeship. A blacksmith has lots of options in the kind of work he or she can do. Traditional blacksmithing generally involves forging, welding, riveting and repairing metal parts for use in farm machinery, and industrial and domestic equipment. But the true renaissance has been in artistic blacksmithing, which is generally custom work in ornamental railings, gates and furniture. I am a strong supporter of the ideals of both ABANA and OABA. The associations work to educate the public about the history and the future of blacksmithing, and they provide a forum for the exchange of information between practicing and beginner blacksmiths. A good example of such forums was the the Bench Project. 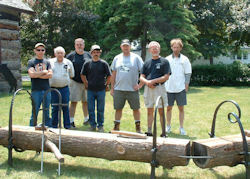 This was a collaborative OABA sponsored piece of work that brought together over thirty members during the summer of 2006 to produce some benches for the Huron County Museum in Goderich, Ontario. A list of the web sites of ABANA members can be found here. Another list of artisan blacksmith web pages is available here. Over the years, we have had many occasions to share our knowledge and interest in this work. We welcome opportunities to give a talk, do a demonstration, and have a group tour the forge. If you are interested in hosting or arranging such an event, please contact us.